Rajasthan Public Service Commission (RPSC) has announced notification for the recruitment of School Lecturer/ Assistant Agriculture Officer Posts. It is a good career opportunity for the applicants who are interested to job in state of Rajasthan. 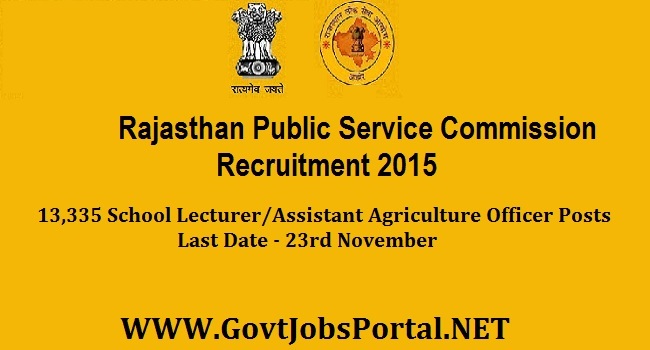 All the Interested applicants can apply for RPSC Recruitment online till 23rd November 2015. The process arranged is for the 13,335 posts of School Lecturer/Assistant Agriculture Officers for which the detail is beneath. Read the full detail carefully & apply for the required post if you are eligible to apply. Academic Qualification: The need of the qualification having permitted for the interested Applicants is the Graduation/Degree/ B.Sc. in Agriculture / Horticulture from any recognized institute /board. Pay Scale: The applicants who are selected will be eligible for a running Pay Scale Rs.9300 - 34800/- With 4200/-, 4800/- Grade Pay. Selection Process: Selection will be based on Competitive Exam (Online/ Offline) or Interview. Mode of Application: Interested and Eligible applicants can apply online through their official website www.rpsc.rajasthan.gov.in till 3rd November 2015.